Can a Felon Become an Accountant? There are resources available for felons though they may not believe they can find a job. Often, they must look at different career path and additional education. Some felons with bookkeeping experience might consider a career as an accountant. 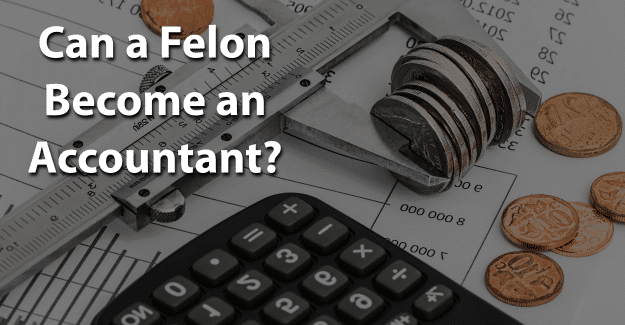 This blog post will address the issue of whether or not a felon can become an accountant. What is Required to Become an Accountant? How Much Does an Accountant Earn? Public accounting. Involves consulting with clients to make certain they’re meeting their tax obligations. Internal auditing. Helps businesses manage their money. Managerial accounting. Works for one business planning budgets and investments. Taxes. Files tax returns for individuals and/or businesses. A college degree is not required to become an accountant. However, a bachelor’s degree in accounting or a related field is required for someone who wants to become a Certified Public Accountant (CPA). Accounting degree programs can typically be found at colleges and universities. Each state board requires a CPA applicant to have a bachelor degree from an accredited university. Typically, approximately 150 hours of college credit are needed. An applicant must complete 30 hours of advanced accounting courses. There are several professional organizations for accountants, including the American Accounting Association and the Institute of Management Accountants. Joining one of these organizations can help a felon get a job as an accountant, but he or she must meet their requirements. According to the U.S. Bureau of Labor Statistics, there were approximately 139,900 accountants and auditors working in 2016 with about 50% of those working as a CPA. The median annual wage for accountants and auditors was $69,350 in 2017. Experience will make a difference in how much an accountant earns annually. The area of the country in which an accountant works also makes a difference in their earnings. Those on the East or West coast typically earn more than an accountant that works elsewhere. This field is expected to grow approximately 10% from 2016 to 2026, which is faster than average. The growth of this industry is related to the health of the overall economy and the need to maintain and exam and financial records. Each state board has a regulation that any person achieving a CPA certificate is of good moral character. Good moral character is demonstrated through a lack of a history of dishonest actions or felony convictions. A state board will review the records of the FBI database and the department of public safety through a fingerprint process for each individual who completes an application of intent. Criminal records that have been expunged or sealed by a court order don’t have to be reported to the state board. A felony or misdemeanor conviction is not an automatic disqualification, but full disclosure must be made. A candidate should retain legal counsel for a background investigation if there is a criminal offense record. Anyone who applies as a CPA must disclose and provide an explanation for any felony convictions in the past 10 years. The IRS will determine whether a felony conviction disqualifies a candidate on a case-by-case basis. Even if a felon is able to become a CPA, he or she still faces the challenge of finding an opportunity to work as an accountant. Many may not be willing to give a felon a chance because of their record. Since businesses are responsible for their financial information, they may not trust someone with a felony to handle their finances either as an accountant or as a CPA. It’s important to be honest in filling out an application when applying for certification as a CPA or for any job as an accountant. If a felony isn’t disclosed but is found on a background check, this constitutes fraud and is punishable. It is a crime to falsify an application, which could result in being sent back to prison. Having their record expunged can give them the chance needed to begin with a clean record and succeed in becoming an accountant. Expunging a criminal record allows anyone to honestly state on an application that he or she has not been convicted of a crime. It’s a big challenge, but it might be worth it for a felon wanting to become an accountant. Having his or her record expunged and also documenting any training programs or additional education could make the essential difference in a felon succeeding in becoming an accountant. Having support from family, friends, or previous employers can make a huge difference. A felon doesn’t have to be defined by his or her crime. We’re not defined by our mistakes but by how we recover from them. He or she can begin again and live an honest life no matter how difficult it might seem. What do you think about this blog post? Have you or someone you know been in the situation of trying to become an accountant with a felony? What was that like for him or her, and how did he or she achieve success? Please tell us in the comments below. The IRS does not license CPA’s…and the information about only reporting felonies 10 years or newer is just made up. Why are you giving advice on this? It is factually wrong.